July is the month of many birthdays at home but unfortunately both the birthday boy and girl have not been at home as they went outstation for some work taking away my chance to bake a cake. To top the challenge, I wanted to frost the cake with homemade quark cheese. I got a very nice recipe of Quark cheese from GermanFood.About.com and decided to get started. The cake turned out deep dark red and I loved the flavour of the cake. 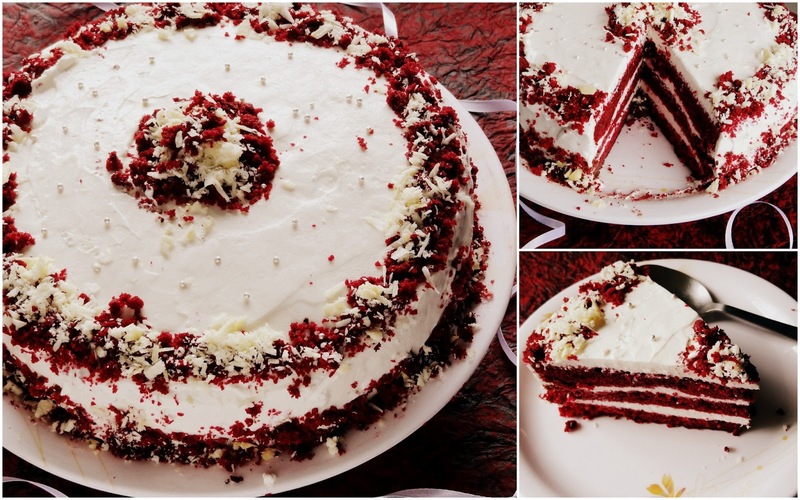 I also loved the combination of red velvet cake with quark cheese and it is needless to say how beautiful the cake was looking with the combination of red and white...truly festive!!! Isn't it??? 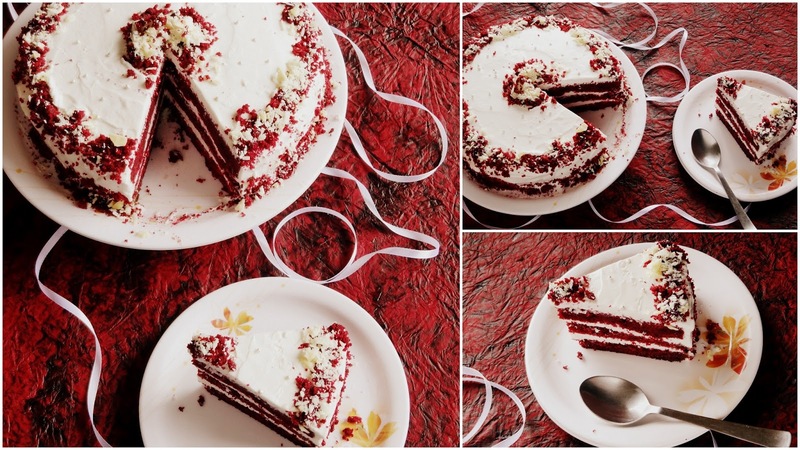 Perfect to try it during Christmas or Valentine's Day!!! Would love to make it again during the next Valentine's Day. And now for you, here's the recipe. Preheat oven to 350 degrees F (175 degrees C). Butter two - 9 inch (23 cm) round cake pans and line the bottoms of the pans with parchment paper. Set aside. Working quickly, divide the batter evenly between the two prepared pans and smooth the tops with an offset spatula or the back of a spoon. In the bowl of your electric mixer, or with a hand mixer, beat the quark cheese until smooth. Add the vanilla and confectioners sugar and beat until smooth. In another bowl whip the whipped cream until soft peaks. Add the whipped cream in quark cheese and stir until well combined. Ensure the frosting is thick enough to spread. Add more sugar or cream as needed to get the right consistency. With a serrated knife, cut each cake layer in half, horizontally. You will now have four cake layers. Place one of the cake layers, top of the cake facing down, onto your serving platter. Spread the cake layer with a layer of frosting. Place another layer of cake on top of the frosting and continue to frost and stack the cake layers. Frost the top and sides of the cake. Garnish the cake with white chocolate and cake crumbs. If you like this recipe and if you want to be updated with the new recipes being uploaded on the blog, don't forget to subscribe on email or like me on FB or simply post a comment about the blog below. I would love to hear from you.